Hopes that global emissions had peaked during the past three years were likely premature. However, GCP researchers say that global emissions are unlikely to return to the high growth rates seen during the 2000s. They argue that it is more likely that emissions over the next few years will plateau or only grow slightly, as countries implement their commitments under the Paris agreement. The GCP is a group of international researchers who assess both sources and sinks of carbon. It has published an annual global carbon budget report since 2006. Its newly released global carbon budget for 2017 provides estimates of emissions by country, global emissions from land-use changes, atmospheric accumulation of CO2, and absorption of carbon from the atmosphere by the land and oceans. The figure below shows global CO2 emissions from fossil fuels, divided into emissions from China (red shading), India (yellow), the U.S. (bright blue), EU (dark blue) and the remainder of the world (grey). After a rapid increase in global emissions of around three percent per year between 2000 and 2013, emissions only grew by 0.4 percent per year between 2013 and 2016. 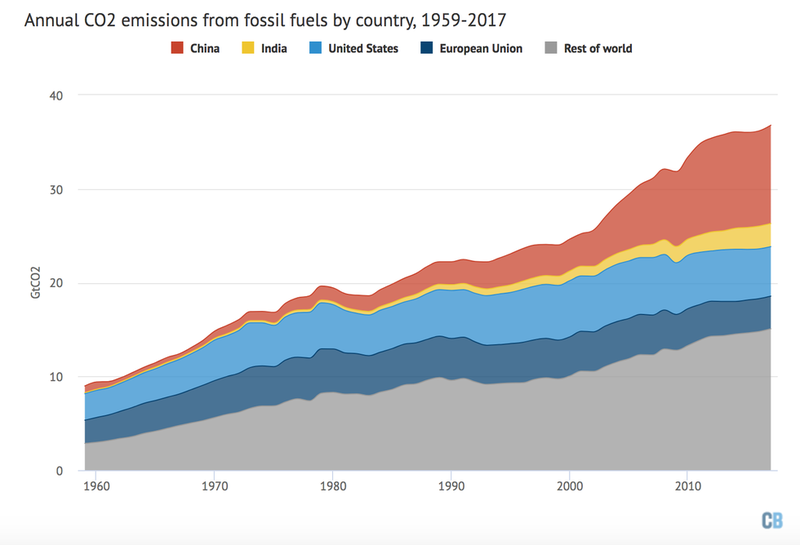 Much of the slowdown in the growth of global emissions in recent years has been driven by a combination of reductions in the U.S. and China, as well as relatively little growth in emissions in other countries. This changed in 2017, with little-to-no reductions in U.S. emissions and a sizable increase in Chinese emissions. India's emissions increased a bit more slowly in 2017 than in the past few years, while the EU's emissions have remained relatively flat since 2014 and did not noticeably change in 2017. The growth in emissions from 2016 to 2017 also more than doubled in the rest of the world. The total emissions for each year between 2014 and 2017 and the countries that were responsible for the change in emissions are shown in the figure below. Annual emissions for 2014, 2015, 2016 and estimates for 2017 are shown by the black bars. The colored bars show the change in emissions between each set of years, broken down by country. Negative values show reductions in emissions, while positive values reflect emission increases.